Feeling tired, low mood, lack of motivation and low energy levels? It may be a few lifestyle changes that can improve how you are feeling – diet and exercise! As it is Healthy Eating Week here are my top tips for eating well and feeling energised! 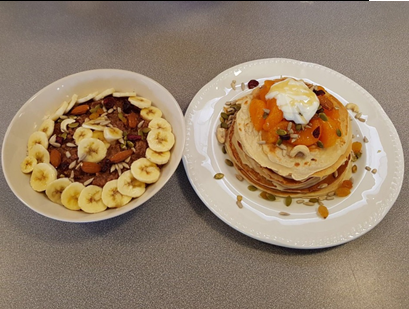 Check out the latest breakfast recipes below to fuel your morning and keep you fuller for longer! Put the oats, cocoa and vanilla in a large bowl and pour over 800ml – 1 litre cold water (depending how thick you like your porridge). Cover the bowl and leave to soak overnight. The next morning, tip the contents into a saucepan with the chopped banana. Cook over a medium heat for 5 mins, stirring frequently, until the oats are cooked. Put half of the mixture in the fridge for the next day. Spoon the rest into two bowls, swirl in 1 pot yogurt and slice over a banana (save the other pot and banana for the next morning). Warm through with a splash of milk to reheat. Cut the skin and pith away from the oranges, then slice into rounds. Put the flour, baking powder and a pinch of salt in a large bowl. Make a well in the middle, then pour in the egg and a splash of milk. Using a wooden spoon, gradually draw the flour into the liquid until you have a lump-free batter. Mix in the rest of the milk, then beat in the ricotta. Heat a large non-stick frying pan and add the oil. Swirl it around the pan then tip out any excess into a heatproof bowl. Spoon in 3 or 4 generous tbsps of batter, spaced well apart, to make pancakes about 10cm across. Cook on medium heat for 2 mins until bubbles appear on the surface. Flip over with a palette knife and cook for 2 more mins until golden. Set aside and keep warm; cook the rest. Stack the pancakes, pile the orange slices on top, drizzle with honey, then scatter with nuts and serve warm. Contact One You Hounslow to help you Eat Well, Move More, Drink Less and Stop Smoking on 020 8973 3530 and don’t forget to sign up to our fun and exciting Cook and Eat sessions!